Industrialists, academics and sponsors came together in Sheffield on 24th November for a showcase celebrating the FACTUM project. FACTUM, was a £1.5m project funded by Innovate UK and industry, which ran between 2013 and 2016. The aims of the FACTUM project were to develop supply chain and full scale production capabilities for novel Additive Manufacturing (AM) technologies based on Laser Sintering (LS) and High Speed Sintering (HSS) for application in three major industrial sectors within the UK economy - Fast Moving Consumer Goods (FMCG), Aerospace and Space. 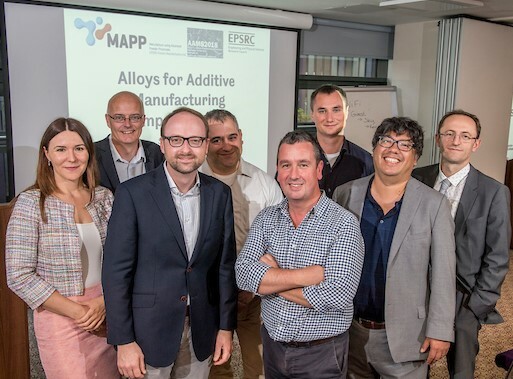 The project brought together a number of industry and academic partners – Xaar, Unilever, Cobham, BAE Systems, Sebastian Conran Associates, Farapack Polymers, University of Sheffield and Loughborough University. The showcase highlighted the advances made with the technology, the impact resulting from the project and plans for the future. Candice Majewski from the University of Sheffield outlined some of the advances made in LS and HSS, including deeper knowledge of process behavior, updated cost models and progress towards closed loop process control. A number of challenges remained, particularly understanding powder behavior and control, and expanding the available range of polymer materials. Further work was ongoing at Sheffield, including the development of a large volume HSS machine, funded by an EPSRC Manufacturing Instrumentation grant, and the recently funded EPSRC MAPP Future Manufacturing Hub. Matt Stevens from BAE Systems spoke about some of the trends within the aerospace industry, which provide both opportunities and challenges for manufacturing, including the move to smaller batch volumes and higher variety products. Matt highlighted the desire to get higher performance from polymers to expand the potential of LS and HSS in aerospace – increasing the strength and improving the thermal performance could allow the replacement of many metallic parts. Work in FACTUM had demonstrated many of the advantages of HSS and highlighted the further work needed to productionise the process. Martin Shelley from Cobham highlighted potential the opportunity for additive manufacturing (AM) of antenna systems, where low volumes presented cost pressures for many traditional manufacturing approaches. Barriers included the need for smooth surfaces, tight tolerances and aerospace approved manufacturing technologies. The FACTUM project had enabled Cobham to make an assessment of AM and the technology was now being used in new technology development. Neil Hopkinson from Xaar spoke about the tangible impact from FACTUM in terms of creating new UK jobs. Neil had recently moved from University of Sheffield to take up a position as Director of Additive Manufacturing at Xaar. Xaar were looking at bringing their printing experience into the development and productionisation of HSS, working with the supply chain. The cost models and part quality demonstrated for the HSS process by the FACTUM project was instrumental in commercial development of HSS and 6 new jobs at graduate level had recently been created at Xaar 3D. Joanne Whitaker from Loughborough University discussed the commercial strategy for HSS, and how FACTUM had been instrumental in demonstrating end user demand for the technology, and supporting licence deals with global OEMs. Fernando Gomez from Unilever spoke about moving AM from prototyping to full scale production within the FMCG sector. FACTUM had allowed Unilever to explore HSS for the production of complex products, which could not be manufactured by traditional methods, such as those with moving parts or complex designs. A number of prototypes had demonstrated the advantages of design freedom and customisation, and cost modeling had illustrated the potential viability of HSS in production. Sebastian Conran talked about the HSS design guidelines which had been produced as part of FACTUM and showed a number of products developed in his studio, including a new sports helmet, an orthopaedic saddle and a light for the Design Museum.